This book gives the history of the Nottingham fishing reel and is something for historian fisher-folk. The official blurb says - "When most people think of Nottingham reels, they immediately associate them with the cheap wooden ones found on various online auction sites: overvalued, over-hyped and underwhelming in their appearance. These are the run-of-the-mill Nottingham reels from the late 1800s to the early 1900s. However, there are others: beautiful works of art that preceded these potboilers, seldom seen and not really understood. 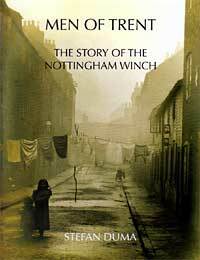 This book will explain the reasons why they were made in Nottingham and not elsewhere. Starting with reels from the early 1800s, the reader will see the biggest collection of iron-pillared clamp winches ever, along with possibly the earliest centre winch to surface so far. Lavishly illustrated with more than 100 full-colour photographs detailing how the reels were made and their variations, it will pinpoint not only the date of the invention of the spring latch but for the first time, identify the individual behind it. This book makes everything that has so far been written on the Nottingham winch either obsolete or incorrect." We do have the review copy which could be made available to a member of the Society for a small contribution to the Thoroton Society bookstall. The title of this book is, of course, a play on words. The two queens are Victoria and Elizabeth II. This very specialised, but nonetheless fascinating, book shows the changes that were made in the practice of bee-keeping during the first half of the 20th century, from 1901 to 1952. Much of the text is taken directly from minutes of committee meetings and from speeches made to members of the local branch of the British Bee-keepers’ Association at their meetings. There are also many quotes from the British Beekeeping Journal and various local newspapers. For example, in 1903, the national association had recommended that bee-keeping be taught in schools. There were, however, problems in some locations. Mr Scattergood reckoned that his local village schoolmaster would not welcome strangers (i.e. bee-keepers) to talk to the children as he (the schoolmaster) ‘generally thought that he knew everything’. There was much discussion on such important topics as hive temperatures and, of course, hygiene. The British Beekeeping Journal sent condolences to Buckingham Palace on the death of King Edward VII in 1910. That year, there were moves to request legislation regarding diseases of bees. However, the bee-keepers were well represented at the Moorgreen Show, where, except for the Hackney Horses section, there was a slight decline in entries. The Royal Show opened in June 1915 at Nottingham, and local bee-keepers and their produce were well represented in the ‘Hives and Honey’ section. Interestingly, the Great War seemed to have little impact on the bee-keeping fraternity, although one member reported that he was ‘working late now on “munitions”, this being the fashionable name for murderous articles of all sorts which are sent to “somewhere in France”.’ Bee ailments such as ‘Isle of Wight disease’ seemed to occupy the thoughts of their keepers, although food rationing caused problems. On 14th August 1919 the British Beekeeping Journal recommended that ‘bee-keepers requiring a supply of sugar for feeding [bees] should apply at once to the Secretary of the Committee dealing with this matter in their respective counties for a registration form.’ This allowed the beekeeper to purchase up to ten pounds of sugar for feeding his stock of bees during the winter. By 1920 this allowance had increased to fourteen pounds. In 1920, the Duchess of Portland was re-elected as President of the British Beekeepers’ Association. If this book has a fault, it is the relative paucity of information from 1921 to 1951. However, the volume does contain some detailed social history of considerable interest. We learn, for instance, that in 1940, due to the shortage of sugar, bees were much in demand in many areas. Many people were becoming amateur beekeepers. 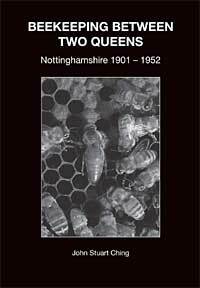 In May 1940 the Nottingham Evening Post reported that ‘as regards beekeeping in wartime, the county was to be divided into five areas with an adviser in each. The advisers would give demonstrations of practical beekeeping’. In 1943, there was a three-day show in aid of the ‘Notts. Comforts Fund’, and beekeeping was much in evidence. In 1944 the Mechanics Cinema showed a film ‘Bees in Paradise’ starring Arthur Askey, about an island run on beehive lines where men were of secondary consideration. Four airmen crash-land on the island, which is populated by beautiful women, but find that their idyll has its problems.